Martin Strong is a student at Monash University in Melbourne (Victoria, Australia) studying Visual Communication. As part of a brief for Typography, he had to choose a typographer that gave him inspiration. He chose John Roshell, because of his interest in comics, and the way typography was used throughout the layouts. With a chosen typographer in mind, he had to interview the typographer, and design a book where the interview would be included. Here is the interview. Martin: Why do you design type, what made you decide to follow a typographical career? John: I guess I was around junior high when it occurred to me that there were such things as typefaces; that it was’t a coincidence that the lettering style on a record sleeve matched what I had seen on a store sign or in a magazine. I tried to mimic fonts like Eurostile and Gill Sans by hand, and then I discovered those sheets of Letraset rub-on letters, and used those a lot for band flyers and student-council type stuff in high school. Once I got on a Mac for the first time, though, it was all over. The idea that I could just type stuff and change the lettering style instantly was just mind-blowing. I went to UCLA and majored in design, though most of the practical knowledge I gained was from my on-campus job in the advertising department, designing all the printed materials for the student union under the supervision of a team of professional designers. The job of actually designing type really just fell into my lap. After I graduated, I was doing freelance design work, and a friend of a friend of my girlfriend was looking for someone to help input comic lettering into his computer. I was always a big Spider-Man fan, so I jumped at the chance. Richard Starkings had been a hand-letterer in England and the U.S. for a couple of years, and had purchased his first Mac and created a basic font of his hand-lettering. I started working for him in the winter of ’92, inputting the type for low-selling books like Cage and Hellstorm (which were the only books he could convince editors to let him use the computer on). Pretty soon he was letting me make updates to the font in Fontographer, and before long I had created a more accurate version of his hand-lettering as well as fonts based on some of his sound effect and display styles. He made me aware of all the great comic book hand-letterers, like Sam Rosen, Artie Simek and Gaspar Saladino, as well as who the best of the current people, like Tom Orzechowski and Todd Klein. Here I had been reading comic books for years, but had never really been aware of the letterer as an individual, and I really never realized how much they contributed to the overall “feel” of a comic. What I had always thought of as the classic 1960s “comic book look” was due in large part to Sam and Artie’s distinctive letters, since they did virtually all of the lettering, logos and advertisements for those old comics. Do you follow a particular style when creating type? Not really — even within the realm of comic books, there’s all sorts of genres, and so I’m pretty much able to run the gamut. I’ve done dozens of hand-lettering styles for the word balloons, and for title and display lettering, I’ll do anything from art deco, to sci-fi/techno, to something sharp and gothic. Is there a particular way that you approach a design brief in typography? Do you have a particular belief in the way type should look, for example, organic or hard edged? Certainly not — type shouldn’t always have to “be” anything. The possibilities are unlimited, an so it totally depends on the font itself, and what it’s going to be used for. Actually, over the last ten years, I’d say that line has really been blurred to the point of disappearing, what with all the classic serif and sans-serif fonts being mutilated and roughened up to make new “grunge” styles. When you begin to create a typefont, what/who do you look to for inspiration? Richard and I realized pretty early on that old comics were where all the other comic letterers were looking as well, so we try to look for inspiration in as many other places as possible. We’re both insane book buyers — neither of us can go into a bookstore without leaving with something. What is your favourite type face that you have designed (can you give me a sample for reference) and what is your favourite genre (ie sci-fi, gothic, etc). TheStorySoFar is a sharp sci-fi font that has its roots in old pulp novel covers. It’s actually a co-design between myself and Richard Starkings — he did the lowercase, and about five years later I did an uppercase for something else that ended up matching perfectly. I use it all the time, particularly on the X-MEN. SchoolsOut uppercase I based on graffiti lettering, but when I did the lowercase I made it more bouncy and cartoon-like, so I’d have more uses for it. I like the way it ended up being neither and both, depending on when I look at it. Dunno if it’s actually a genre, but old comics and hand-lettered signage is what I always have in the back of my mind, no matter what type of font I’m working on. be incorporated in lettering and design as compared to writing or penciling? Well, the lettering in particular is one of those arts that is most effective when it’s invisible. In other words, if someone notices the lettering, then they’ve been distracted from the story, and I haven’t done my job properly. Not that I don’t take every chance to make the lettering as cool as possible — I just do it (hopefully) in a way that adds to the overall presentation, and not at the expense of making it easy to read and follow. And, while bad lettering can ruin a good comic, it often occurs to me (while lettering a lot of what the big companies put out), that no matter how good the lettering is, it can’t make up for a bad story or bad art. 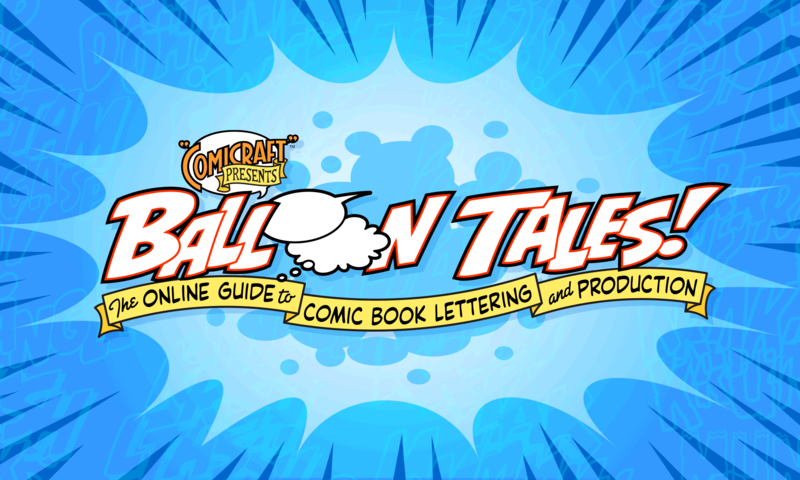 What are your thoughts on typography in general, and typography as it relates to comics? I enjoy comics because, with so many genres, I get the opportunity to try a lot of different things, and express all the different interests I have. In Astro City, for example, I get to pull out all my old Art Deco and Streamline books, and do my own update on that whole “the future is here today” kind of attitude. For the recent Kevin Smith Daredevil storyline, I responded to the artist’s love for Art Nouveau, and created a series of creepy Mucha-inspired fonts. In both of those cases, I got the opportunity to also design the collected book packaging — it’s really satisfying to have that level of control over the whole package and presentation. I can hand someone one of those books and say “every word you see, I put it there.” And Comicraft letters everything from classic comics like Spider-Man and Superman to horror books, to fantasy to funny books, to whatever — it always falls to me to find some way of interpreting it typographically. Of course, part of why I get that level of control is that the comics industry has shrunk to the point where a) it’s possible for one person like me to be involved in many of the top projects, and b) not have to deal with big money people looking over anyone’s shoulder worried about what we’re doing. The downside of that is I feel like most of the people I know (and most people my age) will never see the work I do unless I show it to them personally. It’s not like I’m in TV or doing movie titles, or something where millions of people would see it whether they knew it was me or not. So that’s kind of frustrating, to be kind of holed up in this little cottage industry. But I enjoy the admiration of my peers (and hell, I gotta say it’s a kick being thought of as someone’s ‘hero’ — thank you for that) and my wife and my dog. And hopefully, someday when my 1 1/2 year old discovers my massive collection of comics, he’ll be impressed that his dad had something to do with making a lot of them. Martin Strong is studying Visual Communication at Monash University in Melbourne (Victoria, Australia). This interview was part of a brief for a class on Typography.